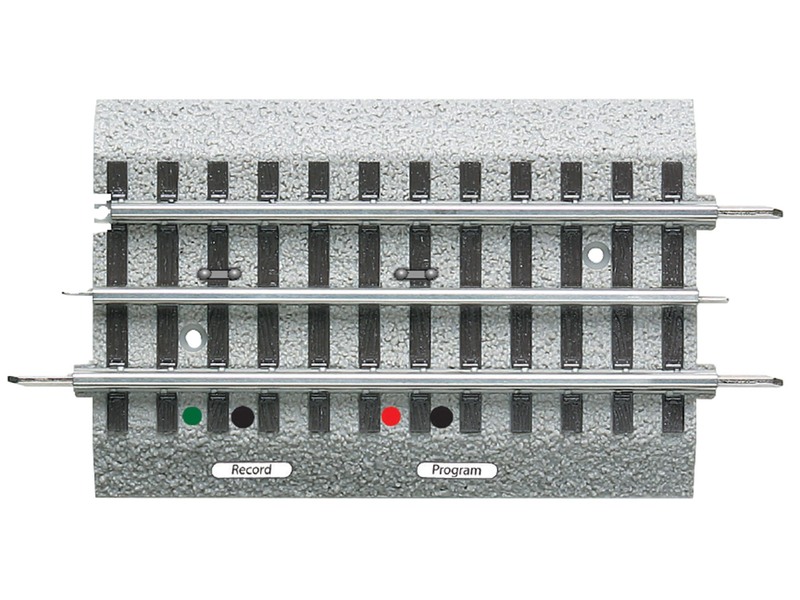 LCS SensorTrack is a 5” straight track section equipped with an infra-red receiver that reads data beamed out of all LEGACY locomotives that are equipped with the an infra-red transmitter It is a simple hookup with pre-made LCS LCS SensorTrack™ is a 5” straight Fastrack section equipped with an infra-red receiver. This receiver reads data beamed out of all Lionel Legacy and Vision locomotives that are equipped with an infra-red transmitter. Click here for a PDF list of compatible locomotives. When a compatible locomotive crosses a SensorTrack, engine details like TMCC ID, road name, number, engine type, lighting options, fuel levels and direction of travel are retrieved by the track and transmitted through your LCS installation. Go to the LCS page learn more. Preset and Custom Action Commands: Use any of the eight pre-programmed actions or create your own automated routines that your compatible locomotives will follow each time they pass the LCS SensorTrackTM. Pre-programmed actions include whistle and horn blows, engineer dialog, CrewTalk, and bell ringing. LCS SensorTrackTM even knows which direction your locomotives is going and performs dialog actions such as arrival and departure announcements accordingly. Record your own series of up to 200 commands from your Legacy CAB 1L, CAB 2, or LCS App. These commands will then be played back automatically each time any IR-compatible loco passes over the track. Alternately, you can make loco-specific recordings so just one engine performs your custom actions. Preset Action commands and custom user recordings are stored locally in the memory of each SensorTrack on your layout. Instant CAB-2 Updates: When your LCS installation includes a LEGACY base and CAB-2 remote, SensorTrack™ automatically programs LEGACY CAB-2 remote with vital engine information. This instant "roll-over update" includes road names and road numbers, current fuel level, lighting options and more. This feature is especially useful when your layout hosts visiting locomotives. It effectively replaces Legacy orange locomotive memory modules. Real time location information: When your LCS installation includes an LCS WiFi, Apple iPad™ and the free LCS App, SensorTrack™ delivers real time location updates on the LCS App. See each compatible locomotive's ID, name and number appear on your iPad each time one crosses any SensorTrack™ on your layout.